Nobel Laureate Martin Chalfie and National Geographic Emerging Explorer Beth Shapiro discuss why only certain species survive and how a growing knowledge of genomes reveals a deeper understanding of life's cycles and secrets. National Geographic Explorer Beth Shapiro describes the common ancestry of polar bears and brown bears. 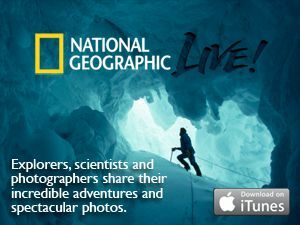 This video was filmed on November 11, 2011 as part of the National Geographic Live! Lecture series at National Geographic Society headquarters in Washington, D.C.
Nobel Laureate Martin Chalfie and National Geographic Emerging Explorer Beth Shapiro discuss why only certain species survive and how a growing knowledge of genomes reveals a deeper understanding of life's cycles and secrets. Beth Shapiro travels through time— observing mammoths, dodos, and other extinct animals; witnessing the last ice age and arrival of humans in North America; watching genetic diversity shrink in one species while blossoming in another. As a molecular biologist, her journey is made possible by ancient DNA samples and statistical models that give science a new view of our tumultuous past. Martin Chalfie shared the 2008 Nobel Prize in Chemistry with Osamu Shimomura and Roger Y. Tsien for the discovery and development of the green florescent protein, GFP. Leading the discussion is Boyd Matson, host of National Geographic Weekend. the end result of two different sources of input. large mammal native to the Arctic.